Dynamix (#3) holds off Mas Pronto Que Alex (#1) and Fast Prize Rumor (#5) in the $50,000 Oklahoma Juvenile Invitational at Remington Park. OKLAHOMA CITY, OK�MARCH 25, 2017�Dynamix encountered a less than perfect trip in her trial for the Oklahoma Futurity, enduring contact at the start which hindered her ability. Saturday night the 2-year-old filly had clean sailing in winning the $50,000 Oklahoma Futurity by a nose over Mas Pronto Que Alex. 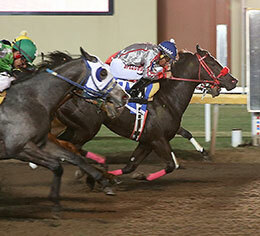 Owned by Rodriguez Racing of Borger, Texas and trained by Esdgar Moreno, Dynamix was ridden by Edgar Martinez. She had to gain to catch Mas Pronto Que Alex but was able to just get there to win the photo-finish, handling 300 yards in 15.522 seconds over a fast track. Bred in Oklahoma by Bobby Cox, Dynamix is a daughter of DOMINYUN from the Corona Cartel mare Corona Edge. Her first career victory was worth $20,000. Abelardo Flores, Jr. and Carlos Lozano's Mas Pronto Que Alex earned $8,500 for finishing second. Jose Vega rode the Inseperable gelding for trainer Eddie D. Willis. Jorge Haddad bred the bay in Texas from Cindys First Cd by Corona Cartel. Third-place finisher Fast Prize Rumor is the second black type earner this year for first crop sire Hez Our Secret. Trainer Gerry McLean conditions the gray gelding for Jose Guzman. Weetona Stanley bred the 2-year-old in Oklahoma from the Corona Cartel mare Coronas Fast Prize. He earned $5,500 for the effort. Despain Gl, Commander N Chief B, Lethal Folly, Mighty B Grateful, Cat Mai Flash, Corona Charm and Miss Tamale completed the field. The betting favorite at 5-2 odds, Dynamix paid $7 to win, $4.40 to place and $3.60 to show. Mas Pronto Que Alex paid $10 to place and $7.60 to show. Fast Prize Rumor was along for third, a neck behind the winner, paying $4.40 to show. The 2017 American Quarter Horse Season at Remington Park continues Sunday, March 26 with the first race at 1:30pm.